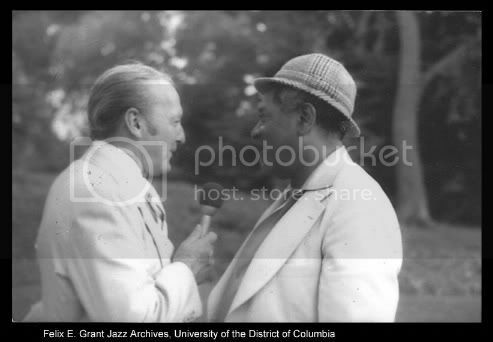 The Felix E. Grant Jazz Archives at the University of the District of Columbia was established as a research and resource center for the study, preservation and continued development of one of America’s greatest original cultural treasures–JAZZ. Monday 8:30 a.m. - 2:00 p.m.
Wednesday 8:30 a.m. - 2:00 p.m. & 6:00-10:30 p.m.
Friday 8:30 - 2:00 p.m.
Felix Grant’s distinctive voice was heard in Washington, D.C., for more than 45 years. He began his brilliant career on radio station WWDC-AM in 1945. Several years later he joined the on-air staff of WMAL-AM, where he spent 30 years as host of “The Album Sound” and nurtured the careers of many young musicians by introducing their music to the Washington area. Mr. Grant moved to WRC-AM in 1984, and he joined WDCU-FM, Jazz 90, in 1987. He exhibited his trademark broadcast professionalism during his tenure with WDCU’s “World of Jazz” show and introduced jazz, blues, and international music to yet another generation of listeners. This radio pioneer played a pivotal role in promoting Brazilian and Jamaican culture in the United States by introducing bossa nova and reggae music to American audiences. It was for this reason that Mr. Grant was dubbed the “Ambassador of Music.” His honors included Brazil’s highest award, the Order of the Southern Cross; recognition from the DC government, including plaques, proclamations, and the designation of Felix Grant Day in 1985; and the naming for him of a music-radio library at the University of Jamaica. He was chairman of the Brazilian–American Cultural Institute and president of Partners of Brasilia. Mr. Grant also established the Felix E. Grant Scholarship through the University of the District of Columbia Foundation. A great evening of Big Band Music! Great archives where I've been once. Felix Grant's distinctive voice was heard on WMAL for 30 years as host of The Album Sound. During his time at the station he nurtured the careers of many young musicians by introducing their music to Felix Grant Archives the Washington area.